I found an easy way to stop your cars pre ignition pinging problem. Our Remedy for the Do it your selfer. "3 things usually causes pinging. Ignition timing is out of whack. Carbon buildup in the piston combustion area. Pinging is a common sound of diesel engines, not gas engines." "Carbon buildup in the piston combustion area," Steve says, "is the most common cause of pre ignition pinging. "Pre ignition means the pistons fuel charge exploded by some reason other than the normal spark plug spark. "Pre-ignition pinging occurs at an earlier, less desirable time while the piston is still going upward in its compression stage. "Pinging is the term given to the sound combustion makes in the cylinder cavity - much like an echo, where as, no sound occurs when combustion is at the correct time. It may sound like several glass soda bottles are bouncing around in the motor. "Pre ignition pinging, if continuous, builds up metal melting temperatures. The blow-torch like temperatures literally burns holes in pistons, producing over 2,500 degrees. That is the bad part." "Actually, most motors ping for a bit to help determine ignition timing", says Steve. "That is the way the motors computer determines when to set and adjust the spark and fuel ignition's timing point. "The ideal time for each pistons spark slams the pistons down - to produce the most power efficiently, and move you down the road with like-new zip - regardless of age or miles. "The knock sensor - think, a ping-hearing device, somewhere on the motor, hears the ping and sends that data to the computer - which instantly adjust the spark such, the explosion - think combustion cycle, occurs at the most beneficial time." "Pinging is bad when it occurs due to carbon buildup as shown in the picture below - because the computer cannot adjust for that abnormal situation. It just continues on and on, and that of course is not good!" 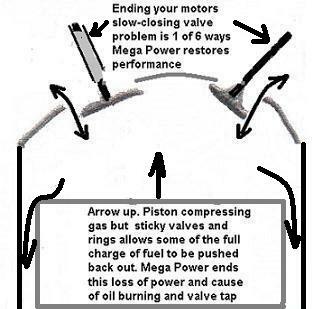 When the piston is about in the position shown, pinging occurs. If due to carbon deposits from residues of gas and oil, serious damage to the motor begins. Repair as an option runs about $2000 or more once damage has occurred. It may be, all you need is a new sensor, or maybe a tune up. For those car owners who feel carbon is the cause should try chemistry made to remove this kind of carbon. Mega Power produces a product treatment to end pre ignition pinging - shown below. Instructions for easy installation of the Mega Power Ping Stopping Treatment. The following two step sequence is what works. 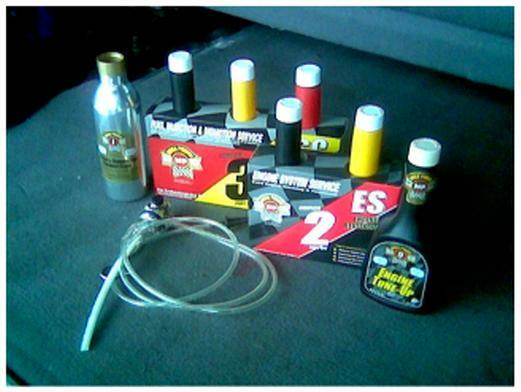 3 of the bottles treat the top part of the motor. The other 3 are installed a week later. Driving does the actual fix. Simple instruction included along with phone help, if needed. Stops other performance causing problems, too If your car has this problem, Stop its pinging problem with the new Mega Power Ping Stopping Treatment. Call to order this product, or if you have a question.